Boston Pops conductor Keith Lockhart announces the program for the upcoming July Fourth concert. The show will go on as Boston's iconic July Fourth concert and fireworks celebration announces a new sponsor and cable TV network. 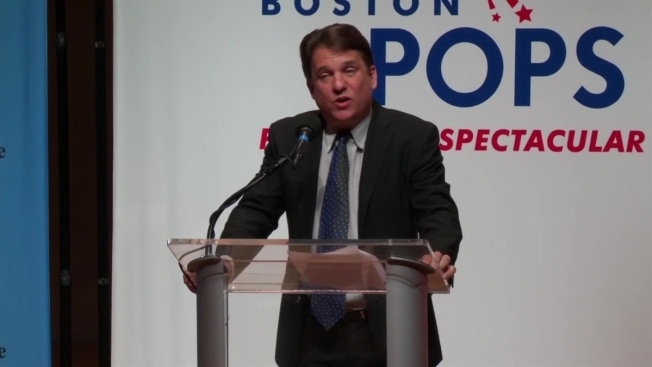 Boston Pops conductor Keith Lockhart said Tuesday the investment firm Eaton Vance has agreed to be the lead funder for the event for at least three years. Bloomberg Television has signed on as a media partner and will carry the concert live on its network that typically focuses on financial news. The changes come after David Mugar, the co-founder and longtime executive producer of the Boston Pops Fireworks Spectacular, stepped down after more than four decades of overseeing the event. Melissa Etheridge and Andy Grammer will be guest performers at the 2017 concert. The event typically draws about a half million people to the Charles River Esplanade.